Federated States of Micronesia - Over USD 10 million – the lion’s share from USAID - has been allocated to support some of the most remote and delicate communities on the planet, in the far-flung Federated States of Micronesia (FSM). Typhoon Maysak hit the northern Pacific earlier this year, causing millions of dollars in damage and claiming five lives. As USAID’s primary implementing partner, IOM has delivered emergency food, water, sanitation equipment and shelter materials to the worst-affected areas, and is now embarking on an ambitious reconstruction plan. Other contributions from the governments of Australia, New Zealand and Japan, have also allowed practical assistance and technical help to reach these critically isolated communities. The USAID funding will enable IOM to rebuild and repair over 600 homes and at least 100 key infrastructure projects such as schools and clinics in the affected communities over the next 18 months. IOM is also providing USAID-funded tents to ensure that the disaster doesn’t interrupt the education of children in remote outer islands, while their schools are reconstructed. In tandem with these recovery-focused activities, IOM will work with affected populations to develop community-led disaster preparedness plans that reflect their experiences during the storm – thereby increasing their resilience and safety before the next disaster. “While the death toll in Maysak was not sufficiently serious to garner major media attention, the ferocity of the storm serves as a strong reminder that weather patterns are changing and becoming more violent,” said IOM’s Chief of Mission in the FSM, Stuart Simpson. In the coming days, US Ambassador Doria Rosen plans to join an IOM team travelling to Yap and Ulithi islands, where much of the reconstruction will take place. Dr. Muhammad Khan, USAID Team Leader for Pacific Projects, noted that IOM and the US Government have a fruitful history of collaboration on disaster response and mitigation in the Pacific region, having successfully worked to relieve the worst effects of a drought in the neighbouring Republic of the Marshall Islands (RMI). FSM and RMI are two nations collectively made up of 1,800 islands spanning 2,000 miles across the northwestern Pacific Ocean. More than 155,000 people living in these islands are vulnerable to slow- and rapid-onset disasters related to climate change, including rising sea levels, and shifting rainfall and storm patterns. Under the Compacts of Free Association between the US Government and the Governments of the RMI and FSM, USAID provides supplementary assistance to disaster management and reconstruction efforts for these independent nations. USAID’s five-year Disaster Preparedness for Effective Response (PREPARE) program follows the Disaster Mitigation, Relief, and Reconstruction Program (DMRRP), under which IOM has established an operational and logistics presence in five locations in the two countries. This entailed pre-positioning humanitarian relief supplies and equipment, and enhanced standby capacity for logistics, medical response, and reconstruction of housing and public infrastructure. Typhoon Maysak reached Category 5 level in late March, making it the strongest North Pacific storm on record for the time of year. It hit Yap and Chuuk States, causing millions of dollars in damage and claiming five lives. In the immediate aftermath, both local and international PREPARE staff sprang to action and, in coordination with State and FSM national authorities, IOM Micronesia initiated life-saving assistance. 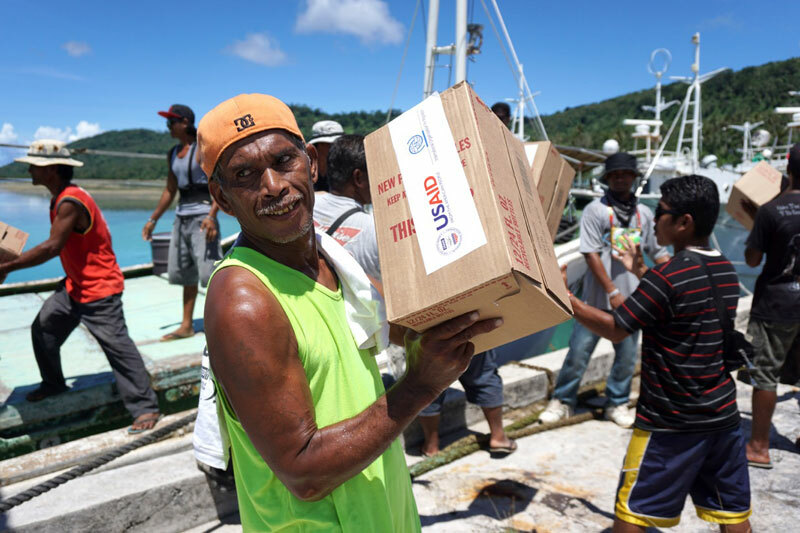 In the days following the event – with the support of USAID’s Office of US Foreign Disaster Assistance, Micronesia Registration Advisors and the Australian Government – IOM began providing food, clean water, shelter and hygiene materials to affected populations. A key preparedness component of the programme was also actualized: the deployment of pre-positioned, USAID-funded relief items stored and maintained by IOM in warehouses in FSM and RMI. This meant that humanitarian relief items, including large rolls of plastic sheeting for shelter, reverse osmosis water filtration machines, high-capacity water bladders, water distribution stands, and sealable water containers could be deployed immediately to these critically isolated communities.